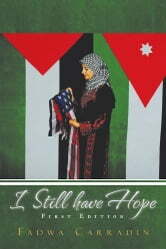 I Still Have Hope follows author Fadwa Carradins journey from childhood in war-torn Jordan, through a painful arranged marriage and the loss of her children, to hope of renewal. When Fadwa was nineteen years old, her parents decided that she would marry a doctor they believed would provide well for her but who proved to be so controlling that he would not allow her to leave home or have any unsupervised contact with friends. Fadwa could not divorce her husband out of fear she would be shunned by her family, so she followed him to the United States and later, to Saudi Arabia, focusing on being a good mother. Seventeen years into their marriage, her husband took a second wife and left Fadwa without sufficient means to support their five children. The only way Fadwa could ensure her children would get an education and have any chance of success was to allow their father and stepmother to raise them in Saudi Arabia and Palestine, not knowing when she would see them again. She returned to the United States in search of new opportunities, even removing the hijab head covering she had worn from the age of ten, so she could serve in the U.S. Army. I Still Have Hope tells the story of Fadwas loss but also of her persistent efforts to rebuild her life and have contact with her children again. Was a little too detailed and long especially the time she was in the army.